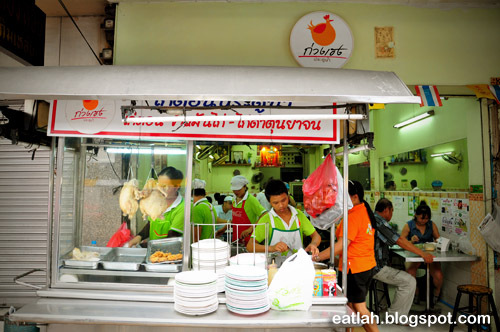 Green T-Shirt Chicken Rice @ Pratunam, Bangkok | where and what to eat lah? 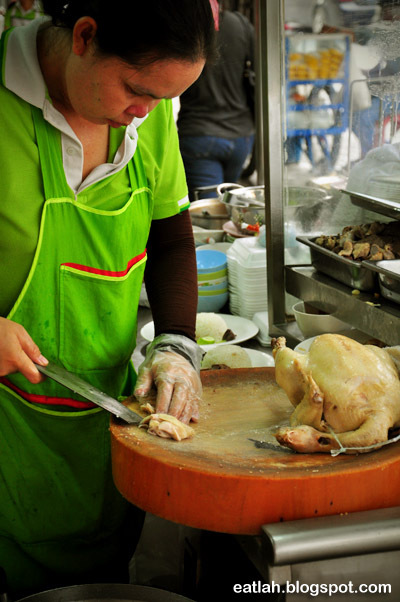 At the Pratunam intersection (Thanon Petchaburi and Thanon Ratchadamri streets), there are few competing khao mun kai (chicken rice) stalls; the tourist friendly menu green t-shirt (located nearest to the intersection), the most popular pink t-shirt Kaiton (located in the middle) and the least known blue t-shirt (located further up). Compared to the pink t-shirt Kaiton, the green t-shirt stall is slightly tourist savvy. With featured articles framed up along the wall, "English speaking" menu and strategic location, this stall will never fail to attract tourists in. Even though the pink t-shirt Kaiton is the most preferred choice, I personally don't find much difference between them. Moreover, this stall opens 24 hours and offers more varieties. 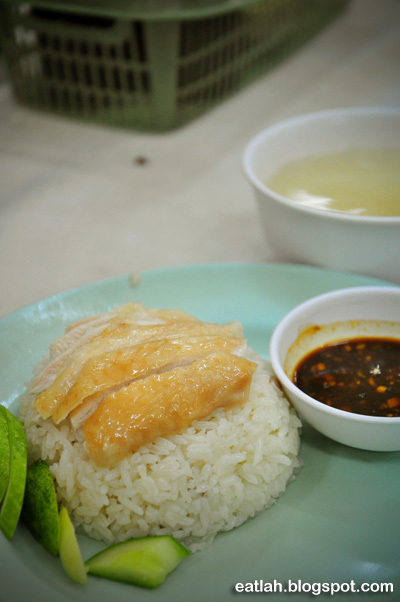 Chicken rice (THB 30 / RM 3.20), boneless steamed chicken meat with a bowl of chicken soup and special dipping sauce made from black soy sauce, soy bean paste, garlic and cili padi (bird eyes chili). Like Kaiton, it's decently taste and for THB 30, it's a steal! However, the chicken soup wasn't as strong and peppery as Kaiton. 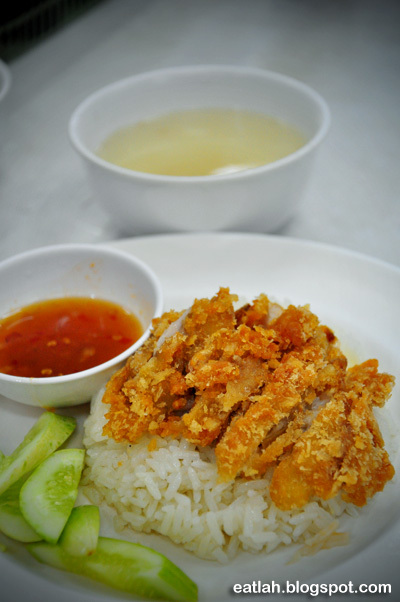 Fried chicken rice (THB 35 / RM 3.70), boneless deep fried chicken meat with a bowl of chicken soup and Thai sweet and spicy sauce. It was okay but the only downside, you don't get the tasty special soy bean dipping sauce. The other selling point of this stall is their satay. They certainly do look different compared to our local Malaysian satay. 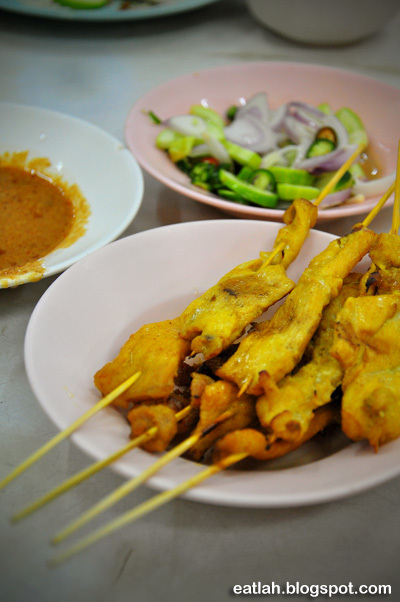 Pork satay (THB 40 / RM 4.20 for 8 sticks), served with peanut sauce, cucumbers, onions and chilis. 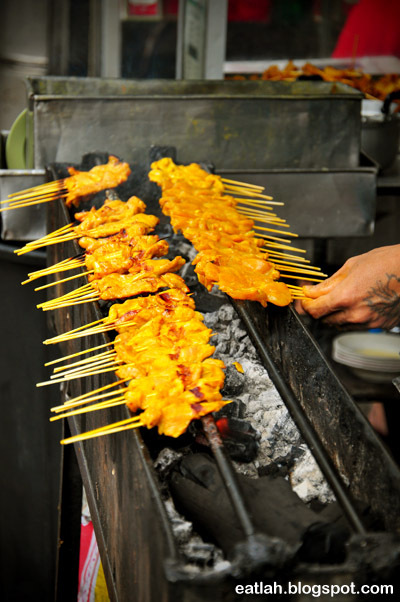 These are probably the thinnest and leanest looking satay I've ever eaten. It was very lean, dry and you hardly get any fats out of it! No wonder you hardly see any overweight Thais, too healthy for the Malaysian! The peanut sauce wasn't very nutty but it was very spicy. I'll stick with their khao mun kai. 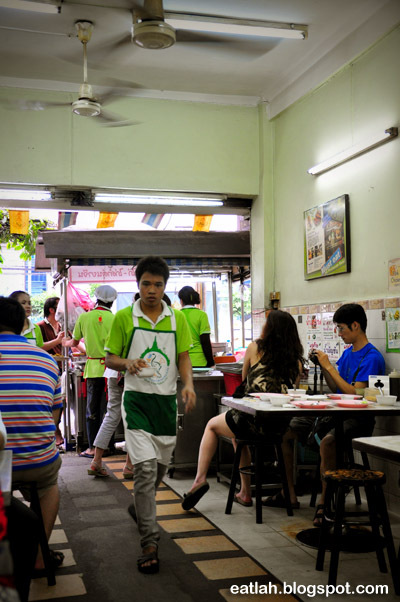 Verdict: This green t-shirt chicken rice restaurant isn't too bad either. If Kaiton is closed or too crowded, this will be a good alternative.